Built in the late 18th century, San Xavier del Bac was first established by Jesuits and later taken over by Franciscans. It was built by Tohono O’odham people and is still in use today. The central portion of the façade has three parts: including the main portal (first floor), a balcony (second floor), and a Franciscan coat of arms (third floor). The plaster statues seen on the façade were once painted in bright colors. Set against the white plaster of the rest of the building, the statues would have had a dramatic effect, as does the bell tower, which stands at 53 meters above the desert floor. The proportions and measurements of San Xavier were developed on site, and suggest the church is parallel to, but not identical with another structure by the same master builder farther south in Senora, Mexico. The master builder of San Xavier del Bac, Ignacio Gaona, had connections across northern New Spain. His work here was for Franciscan friars. Local Tohono O’odham people provided the primary labor for the church and associated structures. William M. Collier, Jr. and Louis Williams, the men who created this drawing, were employed by the WPA (Works Progress Administration), a program funded by the U.S. government in the late 1930s. The church dates from 1783-1797. 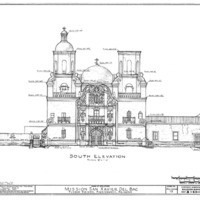 This image, one of 41 drawings of San Xavier del Bac made around 1940, records the height of each main component of the church building as it stood at the time. The drawing is based on careful measurements made on site. Today this drawing and related images are in the Library of Congress, in Washington, D.C., in the Historic American Building Survey collection. It is one of hundreds of plans and drawings made by men employed by the U.S. government, through Franklin D. Roosevelt’s WPA program. Their work, as a whole, helped to create an American architectural history that included indigenous and Spanish traditions with long histories in Arizona, New Mexico and Texas. This elevation drawing was created as part of the Historic American Buildings Survey, a wide-reaching project sponsored by the U.S. government that simultaneously employed people during the Great Depression and documented historic buildings. As a result, in the 1930s, many buildings that had once been stood on the soil of Spanish America were actively made “American” through renovation, restoration and documentation. Acoma pueblo and church, also in Vistas, were documented as part of the same endeavor. Gifford, Gloria Fraser, 2007. Sanctuaries of Earth, Stone and Light: the Churches of Northern New Spain, 1530-1821. Tucson: University of Arizona Press. 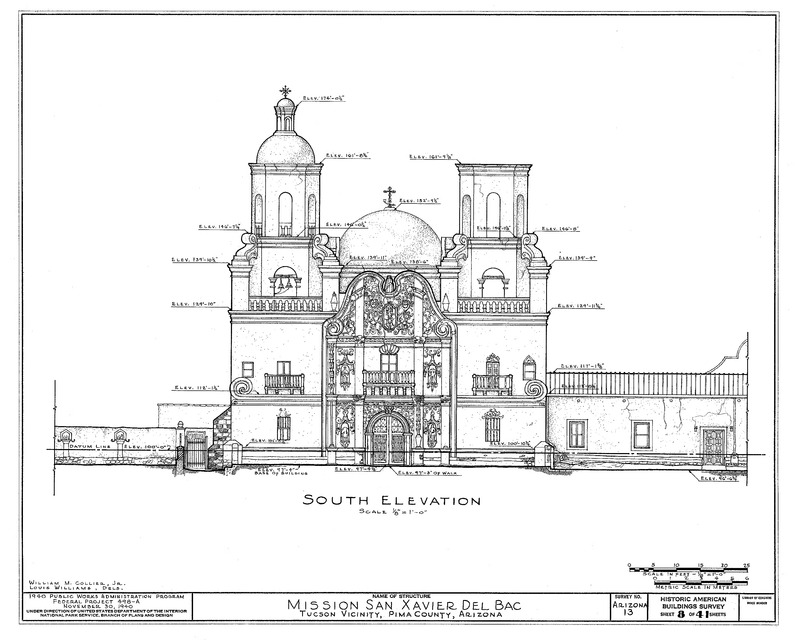 “San Xavier del Bac” In Historic American Buildings Survey/Historic American Engineering Record, 1940. Library of Congress: Built in America. Umberger, Emily. “Bac on the Border.” Anales del Instituto de Investigaciones Estéticas 91, 2007: 68-123.